The Lost Tales of Oz, edited by Joe Bongiorno – I guess this doesn’t count as a traditional review. I’m in this book, so of course I’m going to recommend it. I do want to take a closer look at the individual stories in it, however. Overall, it’s an attractive volume, with illustrations by Eric Shanower. It does look very plain under the dust jacket, but you can’t have everything. There’s a framing device of Dorothy, Betsy Bobbin, and Trot exploring the Royal Library (possibly the same as the Public Library of Oz from The Wonder City of Oz?) and finding some previously unwritten tales. Each one has an introduction from one or more of the girls, and there are a few interludes featuring them as well. I’m not sure that there’s any particular order to the stories; they’re definitely not chronologically arranged. The Great and Terrible Oz Mystery, by Michael O. Reilly – When one of L. Frank Baum’s own mystery stories becomes popular in the Emerald City, it leads to the invention of a mystery game in which many citizens participate. This, however, leads to Ojo and Tik-Tok (a pairing I can’t recall seeing before) getting involved in a REAL mystery, that of the palace being haunted. It’s also suggested by Jellia Jamb that the Wizard of Oz himself could be an impersonator. With some help from Dr. Pipt, they manage to solve the mystery. The Witch’s Mother of Oz, by Paul Dana – I’d seen it suggested before that Mombi, who appears to have particular skill in transformations, might be a Yookoohoo. Paul runs with this idea here, with Mombi being born into a Yookoohoo family but leaving to practice other sorts of magic, and being visited by her mother late in the events of The Marvelous Land of Oz. There was some preparation for this in Paul’s books, as Bina Radget and her family have made appearances. The Trade: A Langwidere Story, by Mike Conway – Princess Langwidere offers to trade one of her heads to Dorothy in Ozma, but Dorothy adamantly refuses. 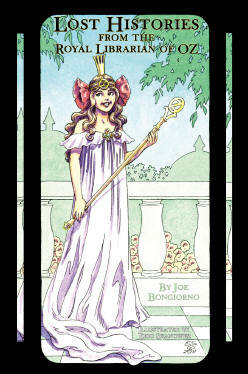 Here, the Princess encounters a girl who WANTS to trade, and a lesson that beauty is in the eye of the beholder. I know Conway’s Oz writing often tends toward the dark, but while there are a few heavy themes here, they still hew pretty close to Baum’s own tone. There may be more about Langwidere coming in the near future. Ojo and the Woozy, by J.L. Bell – In the spirit of the Little Wizard Stories, we learn how this pair adjusts to life in the Emerald City after the events of Patchwork Girl. While the Woozy remains easy-going, Ojo has some trouble making friends. The story has baseball being popular in the Emerald City, which doesn’t entirely fit with the Ozites appearing to be unfamiliar with it during Peter Brown’s visits, but it is mentioned as a sport the students at the Wogglebug’s college play back in Emerald City. The Other Searches for the Lost Princess – This is one of mine, which I wrote because I always thought there were several perfectly good premises left out of Lost Princess. It’s pretty much how I wrote it, although I noticed the joke about Elvis appearing in tabloid headlines before he was even born was cut. I thought it was funny, but I guess it stretches believability a bit. I worked in a lot of references to both my own work and some other lesser-known writings. Chop, by Eric Shanower – This one is a horror story about Chopfyt from Tin Woodman, who has gone from lazy and surly to downright psychotic over time. Button-Bright has a close call visiting the mixed-up man. This is followed by an interlude explaining how Chopfyt was made to drink from the Water of Oblivion and his victims were restored, presumably to bring it into line with Melody Grandy’s Forever, where Chopfyt is still a jerk but not on the same level of destructiveness. It’s interesting that the few people who chose to work with Chopfyt made him a villain, but the situation at the end of Tin Woodman doesn’t seem that likely to last, and he literally has multiple personalities. In Flesh of Burnished Tin, by Jeffrey Rester – From what I’ve heard, Jeff has a complex mythology worked out that encompasses many different aspects of Oz and some other fantasy besides, but he’s so far only had short, enigmatic stories published based on it. This one touches on why Nimmie Amee is staying with the Wicked Witch of the East in the first place, although it doesn’t fully answer the question. Diplomatic Immunity, by David Tai – Betsy and Trot come across Sky Island on the ground in Oz (I guess it must have landed in a way that didn’t cause any serious damage or injury), and have to get it up in the air again, which means dealing with the unfriendly giant frogs of the Fog Bank. It also shows Trot trying to balance her responsibilities and powers as a diplomat for Ozma and Queen of Sky Island, and a temporary falling out between her and Betsy. There’s some good characterization of the protagonists, and it’s nice to see Sky Island again. The Scrap Bag Circus of Oz, by Margaret A. Berg – I remember reading some writings by the late Mrs. Berg back in the nineties, and corresponding with her a bit as well. One idea that recurred in several of her books was that of cloth dolls made by Margolotte accidentally being animated with the Powder of Life. Here, Scraps and the Sawhorse (who is credited as the author, with Berg as editor) come across a group of these dolls who have formed a circus, and are made of some of the same scraps as the Patchwork Girl herself. The Wizard in New York, by Sam Sackett and Joe Bongiorno – I believe Mr. Sackett died while this book was in production. He’s the one who wrote Adolf Hitler in Oz, which I haven’t read yet but probably should, even though I find the idea of Hitler being an Oz villain as…not trivializing, really, but rather too whimsical for someone who caused so much actual harm in the world. But yeah, I should read it before I judge it. Sackett’s two stories here, some of the longer ones in the volume, are sort of prequels to the book. This one has the Wizard visiting New York City during the 1939 World’s Fair, and also watching the MGM Wizard of Oz at the theater and reacting to it. There’s a lot of description of the Fair, which Sackett visited as a kid. He even briefly appears in the story, although he says he wouldn’t really have been as rude as he portrays himself. I’ve been to the site of the Fair in Flushing (it’s the same place where the 1964 one was held), and I’m kind of disappointed that we don’t really have anything like that anymore. I think there just isn’t as much optimism about the future. Of course, this story indicates that the optimism was largely misplaced then as well, as the Wizard’s exploration of the Fair is interspersed with his finding out more about the brewing war in Europe. Ali Cat in Oz – The follow-up to the last story has Ali Cat, a pet the Wizard finds as a stray in New York, exploring Oz and finding how different it is from what he’s experienced in the Outside World. He comes to terms with how the life of a carnivore works in Oz, and encounters several other cats. Catty Corners from Lost King doesn’t appear, but is discussed. There are several references to other semi-obscure Oz works, including an appearance by one of the Noyzy Boyz from Ruth Morris’ Flying Bus. It does seem a bit anachronistic, though, as that story presumably takes place a few decades later. Lurline and the Talking Animals of Oz, by Joe Bongiorno – Presented as the journal of someone who was around at the time of Lurline’s enchantment that resulted in animals talking, the tone is somewhat more reminiscent of Narnia than Oz, heavy in moralizing and mysticism. It’s also interesting that, with religion usually being glossed over in the Oz series, the narrator specifically mentions a minister at a local church preaching from the Bible. There are a few origin stories incorporated, including the beginnings of Rigmarole Town and the reason so many lions live in Mudge. The Wizard Wam and the dog Prince also make appearances, and it ties in with the wraparound story by explaining who the Royal Librarian is. I thought I remembered Joe mentioning before that there would be an origin story for the Lonesome Duck, but while a duck does play a role here, I don’t recall anything beyond that. Tommy Kwikstep and the Magpie, by Jared Davis – This details the beginnings of a relationship between Tommy Kwikstep and Jinjur’s son Perry, with some help from a magpie and the former Good Witch of the North. I think it might have been Dave Hardenbrook who first proposed that Tattypoo in Giant Horse was someone who’d had her form switched with her predecessor Locasta, and Jared goes along with that, although the details are different. Here, Locasta has taken to running a music hall. Ozma and the Orange Ogres in Oz – This is one I originally wrote back in high school that Joe expanded for this anthology. His background for the ogres and details of their leader’s reformation tie in some of J.R.R. Tolkien’s mythology, giving it a bit of a heavier feel that I originally gave it. He also came up with the entertaining idea of the magically animated residents of the Emerald City getting together to scare the ogres, which is great. Quiet Victory, by Marcus Mebes – This short tale features Victor Columbia Edison, the live phonograph from Patchwork Girl, who is quickly dismissed by the other characters. Sure, he’s noisy, but a few fans have noted how the rejection likely makes him lonely. Here, he meets up with the Musicker, who’s also ostracized due to being involuntarily loud and obnoxious. While proud of his his musical insides in Road, here he’s gotten rather tired of it, but he’s also a sympathetic friend for Victor. The Red Jinn, a favorite character of Marcus’ (and of many fans, really), also plays a role. Vaneeda of Oz – Vaneeda, daughter of the Wicked Witch of the East, was a character briefly proposed but never used by Ruth Plumly Thompson. I’d previously come up with some ideas about her and her family, so I incorporated them into this story. I wrote it before “Other Searches,” which also uses the character of the Cookywitch Paella; and I don’t think it’s the last we’ll see of this clan. Jinjur’s daughter also plays a significant part. The Puppet-Mistress of Oz, by Andrew J. Heller – The final story here is a rather disturbing one, but it makes sense with what we know of Glinda. It shows the events of Dorothy’s original adventure from her pragmatic perspective, and explains such things as why the Wizard of Oz would send an unarmed girl off to fight a Wicked Witch. There’s also a companion booklet about the ancient history of Oz, completely written by Joe, that was sent to contributors and is available to buy as well. Addressing Oz and the surrounding fairylands from the third century to the thirteenth, it ties together not only the brief canonical references to this time period, but also such elements as Henry Blossom’s details of the life of Ozroar, Phil Lewin’s Enilrul, and Paul’s take on Lurline and Tititi-Hoochoo. And there are crossovers with non-Oz fantasy works as well, and the early settlers of Oz have their hands full battling eldritch monsters and mad priests of toad gods. I have to suspect that Clark Ashton Smith’s Tsathoggua or one of his fellows is the giant toad the Scarecrow and Cowardly Lion meet in Secret Island. There’s a rather fanciful explanation for the confusion between Lurline and Lulea as well. This entry was posted in Animals, Book Reviews, Characters, David Tai, Eric Shanower, Jared Davis, Jeff Rester, John R. Neill, L. Frank Baum, Marcus Mebes, Melody Grandy, Monsters, Oz, Oz Authors, Phil Lewin, Places, Relationships, Religion, Ruth Plumly Thompson and tagged 1939 world's fair, ali cat in oz, allegro da capo, andrew heller, baseball, betsy bobbin, button-bright, catty corners, chop, chopfyt, dave hardenbrook, diplomatic immunity, dorothy gale, dr. pipt, forever in oz, glinda, good witch of the north, henry blossom, in flesh of burnished tin, j. l. bell, jellia jamb, joe bongiorno, lost histories from the royal librarian of oz, lulea, lurline, lurline and the talking animals of oz, margaret berg, mombi, mudge, nimmie amee, ogres, ojo, ojo and the woozy, ozma and the orange ogres in oz, ozma of oz, patchwork girl, paul dana, princess langwidere, quiet victory, red jinn, rigmarole town, ruth morris, sam sackett, sawhorse, sky island, the emerald city of oz, the flying bus in oz, the giant horse of oz, the great and terrible oz mystery, the lost princess of oz, the lost tales of oz, the marvelous land of oz, the other searches for the lost princess, the patchwork girl of oz, the puppet-mistress of oz, the road to oz, the scrap bag circus of oz, the tin woodman of oz, the trade, the witch's mother of oz, the wizard in new york, the wizard of oz (1939), the wonder city of oz, tik-tok, tititi-hoochoo, tommy kwikstep, tommy kwikstep and the magpie, trot griffiths, tsathoggua, vaneeda of oz, victor columbia edison, wam, wicked witch of the east, wizard of oz, woozy, yookoohoos. Bookmark the permalink.